A few weeks back, AmongTheLeaves.com was contacted by Lucky Gunner to see if we’d be interested in reviewing some of their ammunition on this little website. Free ammo? Here, twist my arm a little. Naturally I agreed, and sent them a list of featured articles I was working on for the next few months. Not long after that, a box of 240 grain .44 Magnum Fiocchi “Pistol Shooting Dynamics” ammunition showed up on my doorstep. Sweet! Hunting season was just around the corner, and this year, instead of using a rifle, I’d already made the decision to hunt deer and feral hog alike with a pistol. My firearm of choice, a Ruger Redhawk, has a 7.5″ barrel with a 1:20″ twist rate, and is topped off with fiber optic sights. The contrasting red and green dots make it very easy to get a clear shot, even in the dusky conditions just before and after sunset. The long barrel gives a longer sight radius for increased accuracy, while allowing for more complete powder burn and higher muzzle velocities. The 240 grain ammo is a little lighter than I prefer for hunting, and Fiocchi isn’t well known in the US market as a manufacturer of quality hunting ammunition, but I figured “What the heck. It’s free ammo, let’s see how it does.” The first step I took in evaluating the ammunition was to try and figure out what type of bullet it was loaded with. Other than the fact that it was labeled as weighing 240 grains and that it was quite obviously a hollow point, no other information was on the box or website. I can’t say for sure, but it looked for all the world to me that it was a Hornady XTP, or else something very similar (and if anyone help me figure out the bullet manufacturer with any certainty, I’d appreciate it). If indeed it is an XTP, any shooter would do well to use this cartridge. The Hornady XTP is well known for its accuracy and is favored by hunters for the superior expansion characteristics it exhibits. 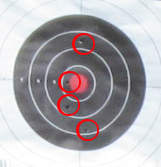 4 shot group fired kneeling, off-hand, at 50 yards using iron sights. Normally, at this point in the review, I’d pull a few bullets and weigh the bullet and the powder charge. That gives an indication of both accuracy and consistency. But, with only 50 rounds to review, I thought it prudent to save the few I had, as we’re planning on doing more than just a range review. These are hollow points, and as such are intended for self-defense and/or hunting. 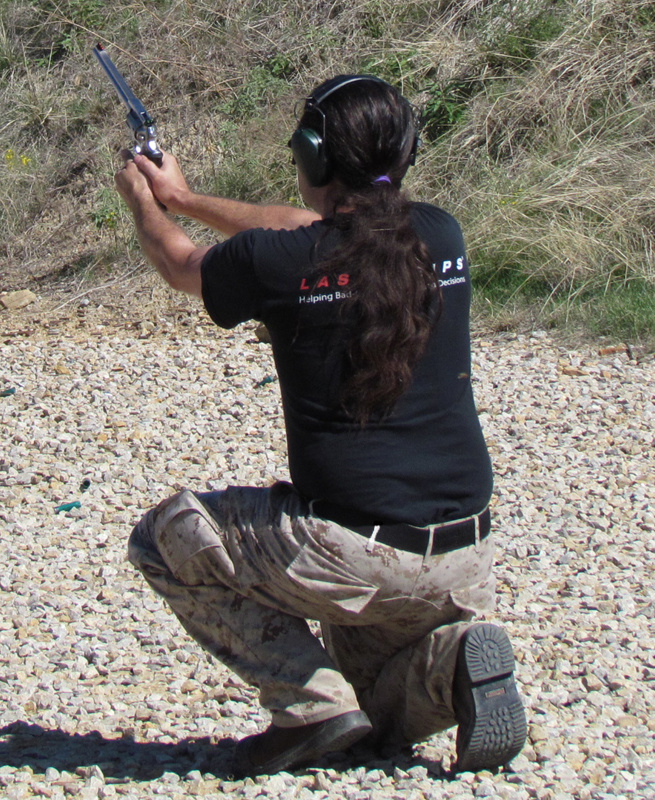 Since .44 Magnum handguns aren’t commonly used as defensive firearms, and since Among The Leaves primarily focuses on hunting and the outdoors, we’re going to proceed along that path. Texas white tailed deer and feral hogs are the two medium sized game animals that I pursue here in the Lone Star State. Texas white tails are small and slender compared to those found in the rest of the country, and are easily dropped with as little as a .357 Magnum or 10mm handgun and a well placed shot. Wild pigs are built a bit more stoutly, but can still be taken using similar loads with shots that don’t have to penetrate the thick shield and shoulder blade. Still, all things being equal, if using a handgun cartridge such as .44 Magnum, more is better. To that end, I developed my own heavy “buffalo bore” load that can generate over 2,000 ft-lbs of muzzle energy by launching a 320 grain bullet at speeds exceeding 1,700 feet per second. At short distances, this allows it to hit nearly as hard, if not harder, than a .45-70 Trapdoor, and with significantly more energy than any .30-30. That’s more than enough to take almost any medium or large game animal in North America. The 320 grain handloads have substantially more recoil than the lighter 240 grain Fiocchi hollow points. Now, to my way of thinking, the more energy I can (safely) get out of my .44 Magnum loads, the better. If I manage to get a shot on a big porker, I don’t want to have to wonder if it’s got enough “oompf” to knock down the hog. So, when I saw that the ammunition I had received was a standard 240 grain hollow point, I was a bit apprehensive. Would it be enough to take a large wild boar? It was time to head to the range. The first step was to chronograph both the Fiocchi alongside my handloads. The testing was conducted in a pistol bay, with the chronograph 10 yards from the muzzle. The results from the chronograph are more or less what one would expect from a 240 grain .44 Magnum load. The median result from our very small sample gives us a measured velocity of 1,679 feet per second, and a calculated muzzle energy of 1,561 foot-pounds. I was a bit surprised to find that, though our 3-shot sample was too small to draw any solid conclusions from, the Fiocchi ammunition seemed to have a more consistent velocity than my hand loads. 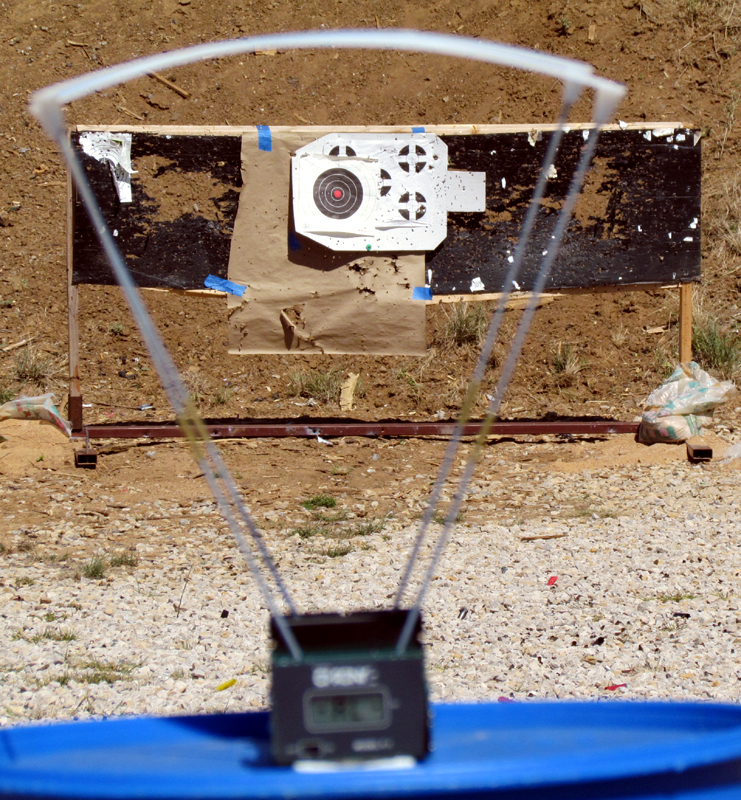 After testing the loads on the chronograph, I did some accuracy testing. So to speak. Ideally, ammunition accuracy is tested from a machine rest like a Ransom Rest to eliminate any other variables that could affect the test. I don’t have a Ransom Rest (check them out: they’re pricey, but fantastic for handgun accuracy testing), and we’re going to be using this ammo for hunting, not for shooting a match. Instead, I replicated what most handgun hunters are likely to experience and fired from a kneeling position at 50 yards using iron sights. The ammo grouped adequately for this purpose. At 6.25″, it wasn’t the prettiest group, but then I’m looking for “minute of deer” not “minute of angle” and for that, it’s fine. The Hornady XTP bullet is well known for it’s accuracy, consistency, and rapid expansion. I’ve found that in these Fiocchi cartridges, it remains a viable choice for hunting. As I mentioned earlier, Fiocchi is not known as a manufacturer of quality hunting ammo. Priced at $0.62 a round (on average, based on market prices October 2011) it costs far less than similar cartridges, and can be perceived as a budget load. Other budget brands have ammunition that is inconsistent, prone to failure, and extremely dirty. 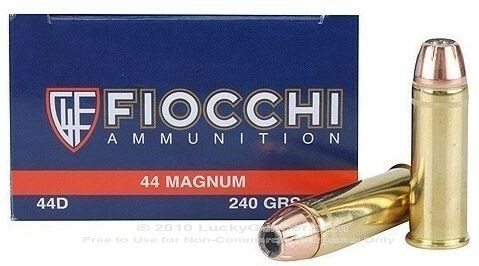 Fiocchi’s .44 Magnum ammunition is none of these things. Based on my experience so far, it performs as well if not better than other premium brands. For the average hunter, Lucky Gunner’s 240 grain .44 magnum loads from Fiocchi are everything they’ll need. They’re accurate, and consistent, possibly even more consistent than my handloads, and that consistency is important for hunters when figuring how much the bullet will drop over a given distance. But the testing of this ammunition isn’t complete just yet. Deer season opens this weekend for firearm hunters, and hopefully I’ll get a chance to bring home some venison or a bit of wild pork. Keep an eye out for more about this ammunition here on AmongTheLeaves.com. FTC disclaimer: I didn’t get paid a damn thing to write this, but they did send me the ammunition for free. That was nice of them. Thanks for the review.From your results it seems Fiocchi 44 magum ammo is hotter than the factory stuff.I have a Super Blackhawk with a 7/12 barrel.Should have somewhat similar results.I have seen a box of 50 for 29.95 for sale on various sites.I thought it was low powered practice ammo,looks like maybe not. Good review. I have recently purchased my first .44 magnum; a S&W model 629 – 5, 6.5″ Classic. This review will add another option to the ammo I will add to my inventory. Hello: I have a Q&A column, and a reader wrote that he fired a box of Fiocchi .44 Mag ammo. And just one of the empties has a plastic cup inside about half the length of the case. Have you any idea what this is? Sounds like they may be downloaded rounds to “.44 Spl.” levels. They could be marketed as “Reduced recoil” or “Range ammo” or “Target loads” or something similar. The plastic cup would be to take up the extra space of the case so that the powder is still packed “full” taking up most of the case volume left over. I’m not aware of any Fiocchi that uses this, however it may be something new.